There were three regular television announcers in those days, McDonald Hobley, Sylvia Peters, and Mary Malcolm, although the actor Donald Gray "stood in" from time to time. Noele Middleton also appeared for a while. One of my more boring duties in telecine was to have to take it in turn to do a week manning the Engineering Telephone switchboard in C.A.R. (Central Apparatus Room), and this was next to Central Control Room, (C.C.R.) 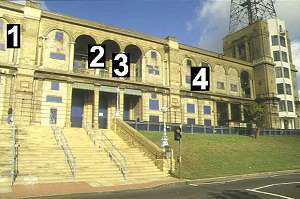 which was upstairs on the same floor as Studio A. Quite often someone at a distant transmitter would ring up and want to speak to the Senior Engineer who was next door in C.C.R. On the occasions when Studio A was busy with a rehearsal, and thus unavailable for a linking announcement in vision, the announcer would make a voice only message from a lip mic in C.C.R, and so the phone must not be rung at such a time. On another occasion, it was a dull, foggy Saturday afternoon in winter, and a football match was on the air. Outside Broadcast cameras didn't have much sensitivity to low light levels in those days, and pictures would be, shall we say, "less than perfect....."
Eventually the phone rang and I got the sarcastic message "Wenvoe here, is there a picture in this noise you're sending us?" One good thing about being in CAR was that I saw Douglas Birkinshaw on the occasions when he came round to make sure everything was OK. When Sylvia Peters did an announcement in vision, it was quite often in a corner of Studio A, and she'd have her script on a chair in front of the camera, or even on the floor. If she forgot her lines she'd bend down suddenly to read them, and then just as suddenly stand up again. Since the picture was a Close Up of her head and shoulders, this sudden vanish and equally sudden reappearance was rather startling....but it was all good fun! 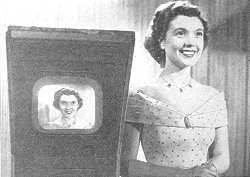 Mary Malcolm, the other regular lady announcer was in radio during World War II, and had been one of the original announcers on the "Forces" programme, and came to television in 1948. She was well known for her "Spoonerisms". 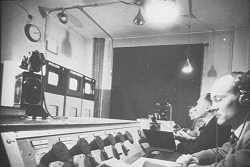 Before television news started in 1954, the tv service played a recording of the 9pm Home Service radio news at closedown each evening. In 1952 Mary Malcolm wrote an article for Radio Times called "My job as a Television Announcer". You may read it here. 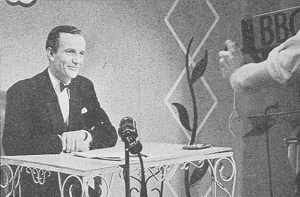 The third member of the regular trio of announcers was McDonald Hobley (known as "Mac"), and he was in fact, the Senior Television Announcer. A very nice man, with a very nice voice who, before his military service in World War II had done acting work. In those days every announcement was scripted and had to be memorised. They were written by the Presentation Department, and only on very exceptional occasions was there any "ad-libbing" permitted.